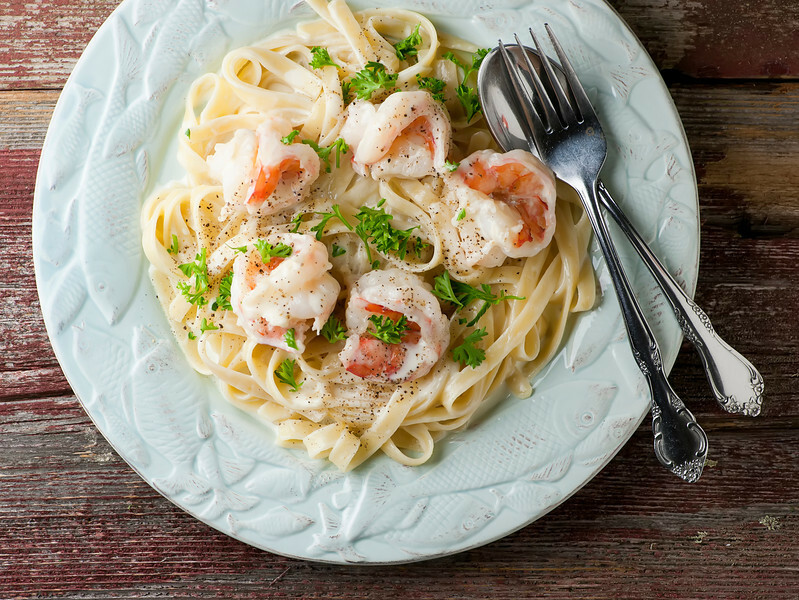 Kick your fettuccine alfredo up a notch by adding tender and tasty shrimp to the mix with this easy recipe! 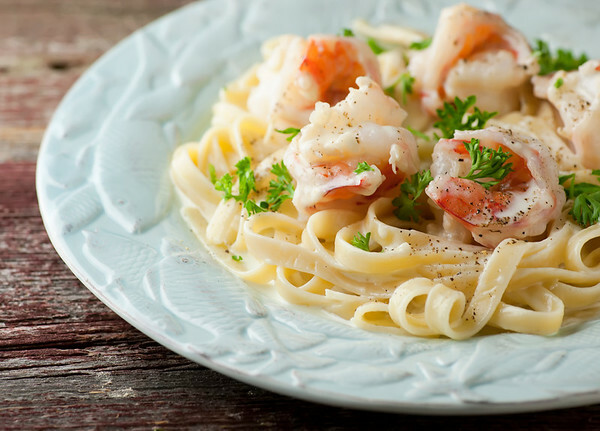 Shrimp fettuccine alfredo – what could be better? Usually when I am inspired to mess around with a perfectly good recipe like fettuccine alfredo, I feel obliged to do a fair amount of explanation as to WHY I am messing around with that perfectly good recipe. For example, the time I made macaroni and cheese soup, and the time I made lasagna cupcakes, and the time I made chocolate dipped bacon. (I know, that one wasn’t exactly a recipe, but I still felt like I should explain myself.) But with this one, I think the whole “shrimp” and “fettuccine alfredo” thing in the title kind of says it all! For you seasoned fettuccine alfredo-makers out there, the basic recipe remains the same – while the fettuccine is cooking, you make a creamy, silky alfredo sauce out of melted butter, cream and Parmesan cheese. (Yup. This is the kind of recipe you can have once a year, but I promise it is worth it!). And now here comes the beauty part…you take a handful of cleaned, butterflied shrimp and cook them up right in that alfredo sauce, just until they are pink and tender and perfect. Cooking the shrimp in the sauce is going to give the sauce just a hint of seafood flavor, which I absolutely LOVE. Now add the cooked pasta to the sauce, give everything a nice toss and divide it up among warmed plates. One of the nice things about alfredo is that a little goes a long way because it is so rich…this is a true quality over quantity supper! Now scatter some fresh chopped parsley on top of everything, grind in a little pepper, pick up that fork and start twirling that pasta. The only downside (and I speak from experience) is that is is going to be hard, hard, hard to go back to plain old un-shrimp-i-fied fettuccine alfredo. But we’ll worry about that another day! Put butter in a large deep skillet over medium heat until melted. Stir cream into melted butter and bring to a simmer. Add cheese to sauce and whisk until smooth. Keeping sauce at a low simmer, add shrimp and cook, turning once, until just cooked through, about 3-4 minutes. Add drained pasta to sauce and toss until well coated. Divide pasta among warmed plates, garnish with pepper and parsley and serve. I can’t talk to you now Kate, I’m drooling too much. And now I just want this creamy silky sauce for dinner!! I couldn’t help but snicker when I read “warm plates” in that description. Awesomeness! Now this is a dish my husband will be ecstatic about :) looks delicious!! Wow! This is a great dish. Very simple and fast but looks like it took forever to make. Thank you! Enjoying as we speak. Absolutely amazing???? my family favorite…..